- Black-White mattes for selected objects or for reflections over selected objects with any supported renderer, with the options of considering current Displacement Maps, Material Opacities, and Object Opacities. -Ambient Occlusion of the scene with any supported Renderer, with the options of wireframed AO for selected Objects (For Mr only) and considering current Displacement Bump, opacity (Vray only) maps. -Reflections on selected objects with any of supported Renderer with the options of considering current Displacement and Bump maps. If there is no light in the scene (default lights) selecting only one geometry object is enough. If there are lights in the scene you have to add them also to the selection. Selected lights not necessarily have to be turned on. You can also blur the reflections with the given spread and sampling values. And turn on or off current Environment Map. -Shadows on selected objects with any ofsupported Renderer. At least one light and one geometry objectmustselected.Selected lights not necessarily have to beturned on or their cast shadowoptions checked. -ZDepth with any supported Renderer. (except Quicksilver Renderer). You can select auto and manual scene dimensions. If you select auto, at least one object should be selected. Any geometrical or non geometrical object(s) can be selected. If it is geometrical it considers nearest and farthest vertexes. If there are multiple objects in the scene, select two objects (nearest and farthest) for best results. Quick Passes dont change your scene settings or materials. Ok, it actually changes them but, puts everything back afterwards. Special Thanks to Ivan Tepavicharov for letting me use his Idea of getting and recalling materials. All Get and Recall functions of Quick Passes based on Ivan's idea. Just run the script, select the pass you want to render, override the renderer if you want, select the necessary objects and/or lights, hit render. Feel free use, distribute, alter and impove it. I appreciate if you let me know about your opinions, bug reports, requests or improvements. -BugFix: Light support fixes in shadow and reflection passes. -BugFix: While rendering ZDepth with Auto Dimension feature on, it no longer leaves unnecessary Edit Mesh modifiers on top of the selected objects. - Added ZDepth Pass. With this option, you can quickly render Zdepth passes while keeping opacity and cutout maps, as well as displacement maps. You can enter the far and near plane manually, or use auto mode to make the script calculate the distances automatically according to the selection. Thanks to Eren Saritas for the idea and technique used in ZDepth pass. - Added Quicksilver Renderer support. It is a partial support, since due to the limitations of QS renderer, it is limited with basic AO and Matte Passes. - Vray AO pass method is changed. Now it uses Dirt Map technique instead of Skylighting, which makes it possible to keep Opacity and Cutout maps. -One version for both Max 2008 and 2009, no idea with 2010, so if anyone try that out on 2010, I would appreciate information about that. -Added Sub-Object function to the Matte Pass. Now it can render mattes of selected faces. -Know issue: Matte Sub-Object function currently support only Editable Poly objects and edit poly modifiers. Selections made with editable_meshes, edit mesh modifiers, poly and mesh select modifiers will be ignored. - Bugfix - qp now overrides network render option when it is off in qp and on in render options. 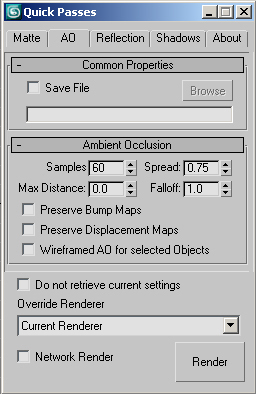 - Bugfix - If an object is invisible to camera, it now stays same after rendering AO with "AO on selected objects" option checked. - Bugfix - if render elements are on now it renders AO pass as it should. - Bugfixes regarding to the save file option. -Several Bug Fixes with save options. -Added new option to AO Pass. 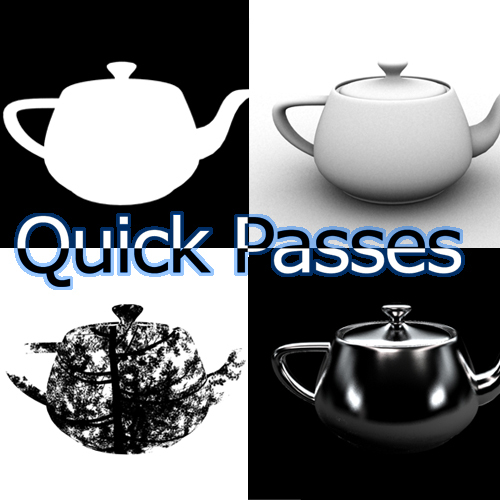 Now it is capable of rendering AO passes only on selected objects. -Support for Mental Ray, Scanline and Vray for each pass. -Options of Preserving Bump, Displacement and Opacity Maps. Submitted by rendergiz on Mon, 2016-10-17 08:38. Nice and promissing script. But working with mental ray, the image precision is very low. Seems that your script changes the quality to 0.25 for every pass except the reflection. Can you tell, where to change this? Submitted by 3dmax farsi on Sun, 2016-08-28 09:34. I'll have a play, looks pretty cool. Submitted by asymptote on Wed, 2016-08-17 15:33. Submitted by Unchuck on Wed, 2016-08-17 05:30. Submitted by asymptote on Fri, 2016-03-18 02:20. I know this hasn't been updated in a while, and I'm not sure if it's me or the script, but I'm getting random crashes and it renders in Progressive mode rather than Adaptive in 2016 sp3 with Vray 3.20.03. I've recently switched from 2015 and pretty lost without this script, hope there's a chance of an update. Submitted by solaFides on Tue, 2015-07-21 13:00. Can you explain the "Quick Passes dont change your scene settings or materials. Ok, it actually changes them but, puts everything back afterwards." comment. How does it do this, with scene states or are these changes coded? Submitted by marctingle on Wed, 2014-09-24 05:53. Amazing script. Works a treat for ambient Occlusion. Will there be any plans to allow the rendered to work with double sided textures? Submitted by Nicholas87 on Thu, 2014-08-14 03:54. Submitted by DavidAnatolie on Sun, 2014-08-10 20:36. Submitted by vyle on Fri, 2014-02-07 12:27. And works great under max 2014.